You may have a ceiling that is badly cracked or maybe the ceiling may of already been papered, whatever the reason for wallpapering a ceiling you are going to need to know how much paper you need to buy. Most commonly ceilings are papered with a thick paper such as 1400 gauge lining paper, an embossed paper or Anaglypta paper. If your ceiling is cracked you will still need to fill the cracks and rub them down before papering otherwise they will show. To measure for ceiling paper, measure the room at its longest point. Allow a little extra at each end for trimming. Write this figure on your notepad. Now measure the room at it’s widest point, again allow a little for trimming. Note this down. You also will need to know the length of the roll of wallpaper you are going to use, typically in the UK a single length roll is 10.05 metres, if you buy a double or quad length roll then these are obviously longer. Make a note of the length or roll on your notepad. 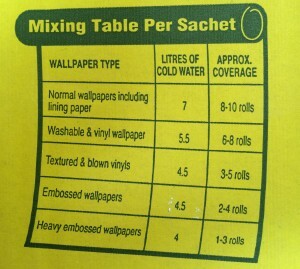 You also are going to want to know the width of the paper, this varies but typical values are 52 or 53 cm for wallpaper and 56 cm for lining paper check with the wallpaper supplier if you are not sure of length and width of a roll of paper. Once you have measured the length and width of the ceiling you are going to wallpaper and have made a note of the length and width of the wallpaper you can now go and use this great ceiling wallpaper calculator to work out how many rolls of wallpaper you need. If you measure in feet and inches the calculator allows you to convert these measurements into metric. If you are going to wallpaper a room, a feature wall, a hall, landing and stairs or even an entire house you will need some idea of how many rolls of wallpaper to buy. With the cost of wallpaper becoming more and more expensive and some shops only ordering in rolls rather than keeping stock you need to have a fairly good idea how many rolls of wallpaper you need. To do this you need to measure each room or area. To measure a complete room for wallpaper, measure around the perimeter for the room, include all doors and windows if the paper goes over the top and /or under them. If you have a picture rail or if the paper does not go over the top of windows and doors only measure the papered area and note this down on your note pad. Now you need to measure the height of the area to be papered, this may be from the skirting boards to the ceiling or coving / cornice, a picture rail or dado rail. Again make a note of this figure. You can measure in either feet and inches or metric, it doesn’t matter. If you are measuring for a feature wall the principle is the same as above except you only measure the one wall you wish to paper, again make a note of the measurements. If you are wallpapering a hallway or hall landing and stairs, again the principle is the same, just treat the upstairs and one room and the downstairs as another room, you can either add the measurements together of treat them as two separate measurements. For more details on measuring a hall, landing and stairs this post is a good resource. Once you have measured the area you are going to wallpaper and have made a note of the perimeter and height you can now go and use this great wallpaper calculator to find out how many rolls of wallpaper you need. If you have measured in feet and inches the calculator allows you to convert these measurements into metric. Watch this quick video to see how easy the wallpaper calculator is to use. 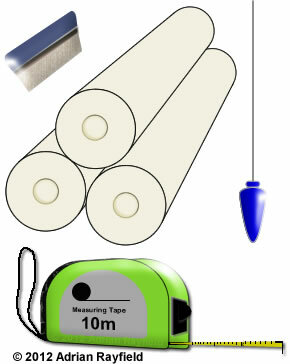 If you are going to line your walls with lining paper rather than wallpaper, measure the same way as described above and use the wallpaper calculator, this calculator allows for a standard roll of wallpaper (10.05m by 0.53m) and although lining paper tends to be wider at 0.56m the calculator will give you a guide number of rolls, and as lining paper is cheap if you end up with a roll over it doesn’t matter.